4-6 sweet potatoes, light colored, orange or purple flesh, rinsed, but NOT peeled. Place rinsed sweet potatoes* directly on oven rack (do NOT wrap in foil) and place a large piece of foil on the rack below to catch any drips. Roast at until tender, approximately 30-40 min. Slice steaming hot sweet potato open and fill with chopped greens, then beans (warm up if cold), cabbage, salsa, cilantro, scallions, avocado and a squeeze of lime juice. When choosing sweet potatoes, be sure that they are heavy for their size, firm (no soft spots or wrinkled ends), and of similar size, so that the will roast in about the same time. Be sure to roast enough sweet potatoes to used for the rest of the week, so they will be at your fingertips when you come home hungry. 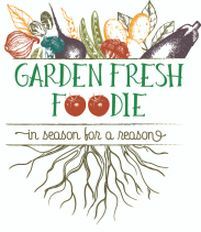 Any fresh greens will work, including baby spinach, kale or Swiss chard. Put the tomatoes in a blender and process until the texture resembles a chunky sauce. Put the tomatoes, onion, cilantro, cumin, cayenne pepper, and salt in a large skillet. Bring to a simmer and cook for 7 minutes over medium-low heat. Add the sweet pepper, cover, and simmer for 5 to 7 minutes. Add a bit of water if pan becomes dry. Meanwhile, combine the tofu, turmeric, tamari in a medium bowl and mash with a potato masher or large fork until the tofu resembles the color and texture of cooked scrambled eggs. In a nonstick skillet, cook the tofu mixture for 5 to 7 minutes, or until heated through, stirring frequently. Add a bit of water if pan becomes dry while you are cooking the tofu. Remove the tortillas from the oven. For each serving, place a tortilla on a large plate. Spoon one-quarter of the tofu mixture over the tortilla and then top with one-quarter of the tomato sauce. Begin by roasting the chiles for 20 min in a 250 degree oven. Then, snip off the stems and clean out any seeds or membranes. BE SURE AND WASH YOUR HANDS AFTER HANDLING CHILES! Add cleaned chiles to a large pot and cover them with water. Add ¼ onion and 2 garlic cloves, bring to a simmer, reduce heat and cover. Let steep for 10 min. Add softened chiles, garlic, onion and 1 c of chile water to a blender. Add spices and blend until smooth. Clean and slice mushrooms and add to a large soup pan or Dutch oven. Stir in soy sauce and smoked paprika – sauté until softened. Stir in remaining ¾ onion and garlic. Add 4 c of vegetable broth and 2 c of water, stir. Add 2 cans of hominy, rinsed and drained and stir to combine. Add bay leaves, oregano, cumin and Red Chile, stir to combine. Add diced potatoes and bring to a simmer. Simmer over low heat, covered, for 30-45 min or until potatoes are tender. Add the tomatillos, husks removed. In a skillet, add vegetable broth or water. Sauté onions for 3-5 min until soft. Add minced garlic and sauté until fragrant. 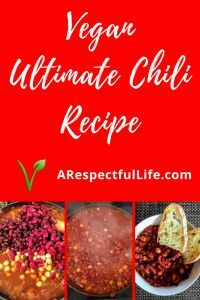 Add the jalapenos and dried chili peppers. Sauté for another 3-5 min. In a blender, add ` t salt, the lime juice, cilantro, drained and boiled tomatillos, cooked onion, garlic and pepper mixture. Serve as desired. In this case add equal parts of quinoa, corn, beans and salad to a bowl. Cover with desired amount of chili lime sauce and mix together. Top with a sprig of cilantro and ahlf a lime for garnish, serve with additional sauce on the side. Serve with additional sauce on the side, tostadas or chips. Yum! Layer ingredients in the order above into (our choice of) a 10” x 10” glass casserole dish - or - into 8-12 individual serving glasses, depending the glass size and the depth of each layer. Start with refried beans, to create an even base. Top with salsa, then oyogurt, then avocado or guacamole and finally with sliced olives, red peppers and cucumbers. 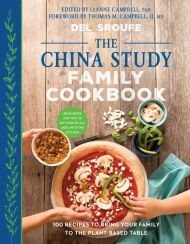 Cover and chill until serving time and serve with toasted tortilla chips or fat-fee whole grain crackers. Heat a large skillet. Once hot, add in onions, garlic and 1-2 T water to prevent sticking. Sauté until slightly golden, add in jalapeno and bell peppers. Stir in quinoa, beans, broth, tomatoes, cumin, salt and bring to a boil, reduce heat to a simmer. Cook until quinoa is softened (Not mush), about 15 minutes. Add additional broth if needed. If using spinach, fold in once the quinoa has cooked. If using kale, blanch in a separate pan and fold in at the end. Season with freshly ground pepper and cayenne if desired. Add lime juice and fresh cilantro. 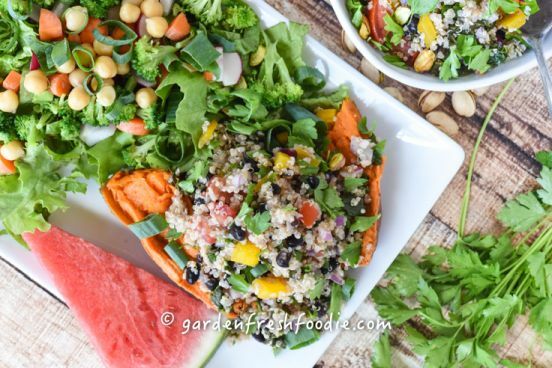 Mexican quinoa salad is great on top of a sweet potato, salad or stuffed in peppers as a protein packed, plant-based and oil-free dish. 1/2c fresh salsa; your favorite no oil, low sodium and sugar, drain excess juice. Microwave your potato until softened, about 5-7 minutes on high with some water in a covered bowl. Check after 5 and proceed when tender. Cut lengthwise and fluff flesh with a fork to receive other ingredients. 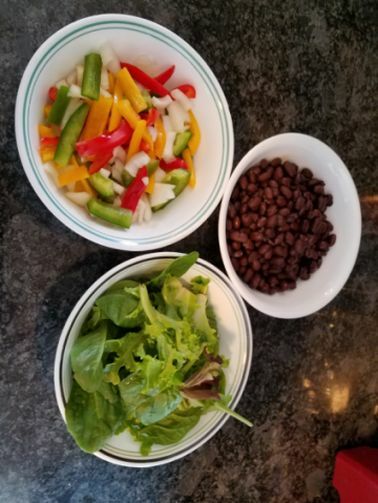 Place black beans, then salsa, greens and last, the peppers and onions on the potato. Cover, I use paper towel, and cook on high for 3 minutes. Scrub your potato(es) and pierce for easier cooking. Drain your salsa if you want a dryer potato meal. If you make the creamy vegan cheese sauce on the PBNSG site by Chuck Underwood, that’s great addition, if you have on hand, place directly on potato and the rest of the ingredients. You can use a sweet potato, too. Your favorite bean, or oil free refried beans can be used, too. In a non-stick pan, steam cubed sweet potatoes on medium-high heat with a little bit of water for 8-10 min until soft (but not mushy and set aside. Sauté cilantro, onion and garlic until onions are translucent. Deglaze pan with lime juice. Add ALL ingredients together, stir in spices and heat on medium heat until hot. About 15 min. I usually wait a few minutes to add the black beans so they do not get mushy. Serve in tacos, burritos, lettuce wraps or on salad greens. In a large pot, sauté onion, garlic, jalapeno pepper and red bell pepper with water or vegetable broth, until onions become slightly translucent. Add drained beans (and corn if desired). Simmer all until chili is to desired thickness, approximately 30 minutes. If you want to speed up the process and make a very thick chili, add a little mesa flour. When using canned beans, I prefer to add the beans later in the recipe so they don’t become mushy. Chili is always best the next day if you cool it and allow the beans to absorb all of the seasoning. If you prefer to cook your own beans, they tend to be a little firmer and the cooked beans can be added at the same time as the tomatoes and would require a bit more salt. Canned beans already have salt added. Deglazing is a fancy and intimidating word that means to pour some cold liquid into a very hot pan to get up all the brown bits stuck to the bottom of the pan. Those brown bits are where all the flavors are, and it is called “fond’. In a large, deep skillet (cast iron is perfect for this if you have one), heat 1/3 c of the vegetable stock over medium heat. Add the garlic, jalapeno & poblano peppers, butternut squash, additional 1/3 c of vegetable stock, tamari and spices. Raise the temperature to medium-high, cook, stirring often, for 10-13 minutes, until squash pieces are el dente. 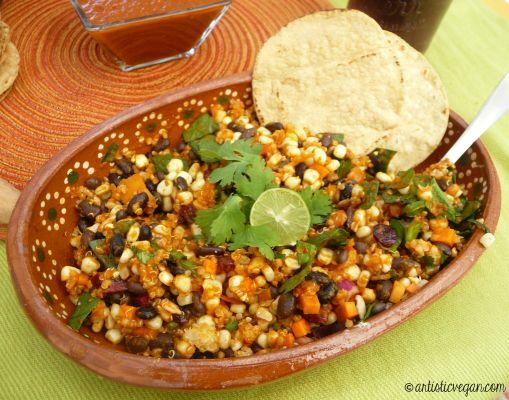 Add the corn, black beans, crushed tomatoes, hominy and adobo sauce as well as ½ - 1c of vegetable stock. Take mixture and begin filling the peppers and place on a large cookie sheet. Bake for 30-40 minutes or until the peppers are appropriately decrepit looking. Pepper colors are totally up to you. Saute the onion and pablano pepper in a large skillet over medium high heat for 7 to 8 minutes, until the vegetables are tender and the onions have started to brown. Add water to 1 to 2 tablespoons at a time to keep the vegetables from sticking. Add the garlic, and ground cumin and cook another minute to toast the cumin. Add the potatoes, sea salt and cayenne pepper, and mix well. Set aside, so you can toast the tortillas. To toast the corn tortillas, heat a skillet over medium heat for 5 minutes. Place a layer of tortillas in the pan and let them cook for 2 minutes. Turn and cook the other side for 2 minutes. Repeat with the remaining tortillas. As you pull the tortillas from the pan, fill each with ¼ c of the potato filling and roll the tortilla up around the filling. Place the rolled-up taquitos on a baking sheet. When all the taquitos are made, bake them for 10-12 minutes until the tortillas start to brown. 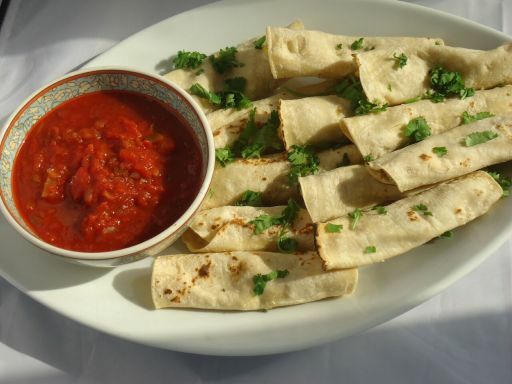 To serve, place the taquitos on a serving platter and garnish them with the chopped cilantro. Serve with your choice of salsa &/or guacamole (plant strong only). PS Amazing Cauliflower Taco "Meat"
Garnish with lettuce, tomatoes, jalapenos, or avocado. My Green Chile Sour Cream goes very well with these tacos as does my Taco Bell Fire Sauce. 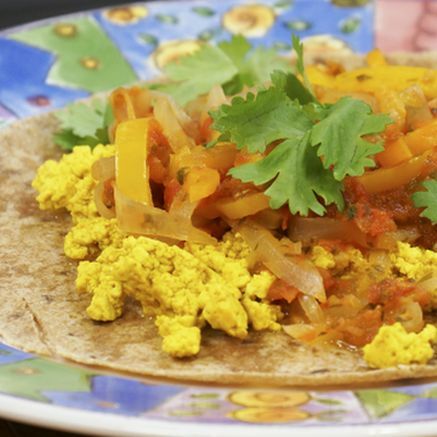 If using – add seitan, cauliflower crumbles, or mushrooms for a meat substitute. Note: All of these are optional and you could just add another can of beans. Add water and all spices except Masa and stir well. Mix in beans and stir well. Add tomato sauce and diced tomatoes to TOP of stew and DO NOT STIR. Add lid to Instant Pot and set to MANUAL mode for 10 minutes. Allow to naturally vent when completed for 10 minutes before CAREFULLY releasing any additional pressure. Stir in tomato paste, add any last minute garnishes and Masa flour. Let rest for 10 minutes to thicken, stirring occasionally. Cauliflower Crumble Recipe: Only use soy sauce to spice, nothing else. Garnish with pickled jalapenos, green onions, or my Green Chili Sour Cream. 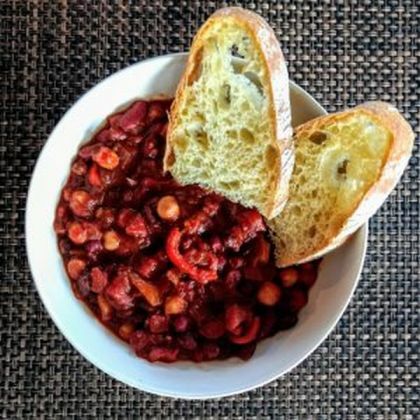 Put all of the chili ingredients in a large bowl and stir to combine. Pour the mixture into a medium casserole dish. Cover, and bake for 35 minutes. Remove the chili from the oven and stir it. If the chili seems dry, add more molasses or catsup to achieve the desired consistency. Cover and bake for 10 minutes more, or until bubbling and browned around the edges. Transfer the pan to a wire rack and let cool 10 minutes before serving. Serve the chili in deep bowls, topped with scallions. Dust with chili powder (if using). Recipe used by Permission from Publisher/Ben Bella Books © 2013 Laura Theodore, the Jazzy Vegetarian, host and creator of Jazzy Vegetarian on PBS and author of Jazzy Vegetarian Classics: Vegan Twists on American Family Favorites and Jazzy Vegetarian: Lively Vegan Cuisine That's Easy and Delicious. Winner of the Taste Award, "Best Health and Fitness Program (Food and Diet)"